Talk about handy! 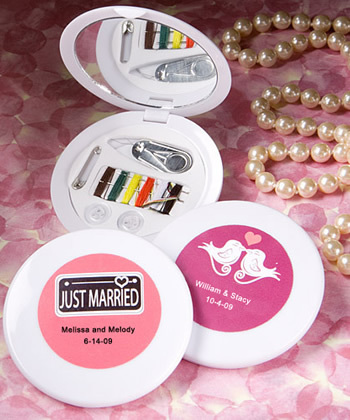 These sewing kit favors will literally keep your guests in stitches! A perfect one-of-a-kind choice for your Sweet Sixteen, wedding or any other special event, these favors really reflect well on you. Each Personalized Expression Collection sewing kit favor from Fashioncraft, measures 2 ¾” round with hinges and has a white plastic exterior and a handy glass mirror and sewing kit – complete with a safety pin, two needles, a threader, two spare buttons and a variety of threads – tucked inside. The compact’s outer center is fit for easy application of the personalized label of your choice. From assorted color combinations, to seasonal and themed designs, to your own title, you design the eye catching label that suits your style! Each comes bulk packaged in a poly bag, along with self sticking label sheets for you to apply. Please allow 3-4 days for production. Due to personalization, you must order at least 40 favors.